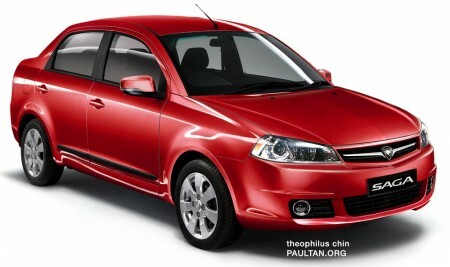 Proton Saga Facelift Artist Renderings - debut at KLIMS? 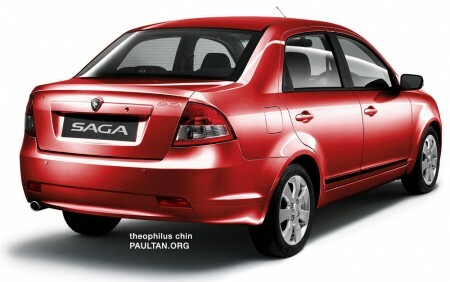 Home » Special Coverage » New Proton Saga » Proton Saga Facelift Artist Renderings – debut at KLIMS? Proton Saga Facelift Artist Renderings – debut at KLIMS? Here are artist renderings of what the upcoming Proton Saga Facelift could look like, created by Theophilus Chin based on our previous sightings of the car (once in a parking lot and another time on the move). I highly doubt that a price-sensitive model like the Saga would come with the projector headlamps that Theophilus has given the renderings above though (nothing wrong with a little wishful thinking eh? ), but the rest of the details were done based on the spyshots, such as the new shape for the headlamps and the front grille, as well as the reflectors on the rear bumper. If you want a recap of how the taped up Saga facelift test units look like, you can refer to our two previous posts or check them out after the jump where we’ve embedded them for reference purposes. We expect the 2011 model year Proton Saga facelift to be officially unveiled at the KL International Motor Show 2010 at the end of the year, as Proton has previously indicated that it will be unveiling a facelift model there. Next Post: Renault Megane RS spotted again in Langkawi!